Tuesday night my mom and I went to hear former U.S. Poet Laureate Billy Collins read at the library. It was a packed, standing room only crowd, pretty impressive for a poetry reading. We arrived about 10 minutes before the reading was scheduled to start and all the chairs had long been taken. We ended up sitting on the floor in front of the merchandise table, which turned out to be highly strategic, since we were able to be first in line to purchase a book and get it signed. 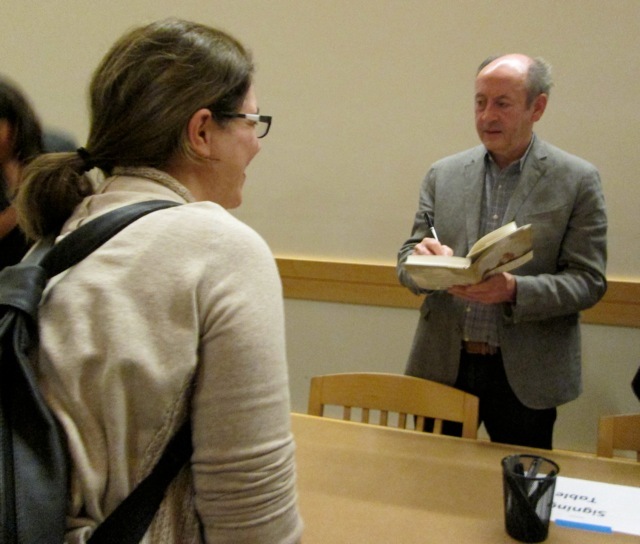 Billy Collins signs my copy of his new poetry collection. Though he’s not (yet) one of my literary heroes, I do like Billy Collins. He seems authentic and warm. It’s nice to see a poet have a sense of humor about poetry. I’m sure that’s why he’s so popular. He makes poetry accessible to people. You don’t have to spend a lot of time analyzing his poems for meaning. They are what they are. He even said that poets aren’t thinking about the symbolic meaning of something when they write a poem, they are just writing. I’m sure this depends on the poet. Of course your unconscious mind will create symbolism on its own, so if a writer is really tapping into their unconscious then their work might be rich with symbolism without them even trying. Take Homer’s Odyssey, for example. But I’m sure that plenty of poets use metaphor and symbolism quite intentionally. So that’s the catch about Billy. What makes his poetry so popular is its simplicity and humor. But I love poetry that’s complex and that you have to really think about to understand. I really enjoy figuring out the hidden meaning in a poem. For Billy Collins, there is no hidden meaning. What you see is what you get. And maybe that’s enough. What a wonderful opportunity! Did he read new material or classics? I love ‘Litany’ – ‘…You are the white apron of the baker, and the marsh birds suddenly in flight…’ I don’t think that Collins’ poetry is necessarily lacking a hidden meaning but rather that his accessibility makes it easier for the reader to internalise a poem and the honest struggle then is to find one’s own ‘hidden meaning’. Perhaps! Anyway, sounds like a lovely way to spend a Tuesday evening. Well it’s as you said: what YOU see is what YOU get! I agree, I enjoy reading Billy Collins and poetry like his for its simplicity and comfort and because it helps me to unwind, it’s why I compare listening to his work like taking a hot bath, it soothes, relaxes and demands nothing of the reader and sometimes we need a book not just a poem that does just that. I don’t demand more than that from his work. What luck to hear him speak, I love his speaking voice. Yes, it was great hearing him speak. I almost didn’t go but I’m glad I did.